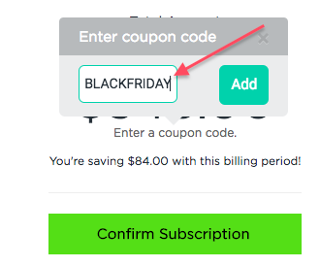 If you have a coupon code to buy, or upgrade your subscription with Lodgify, make sure you apply the code correctly before you finish the purchase. 💡 Note: Voucher codes are only valid for purchasing new subscriptions or upgrading an existing subscription. Enter your personal information and property details. See instructions here. Click on the yellow button Upgrade in the upper navigation bar. 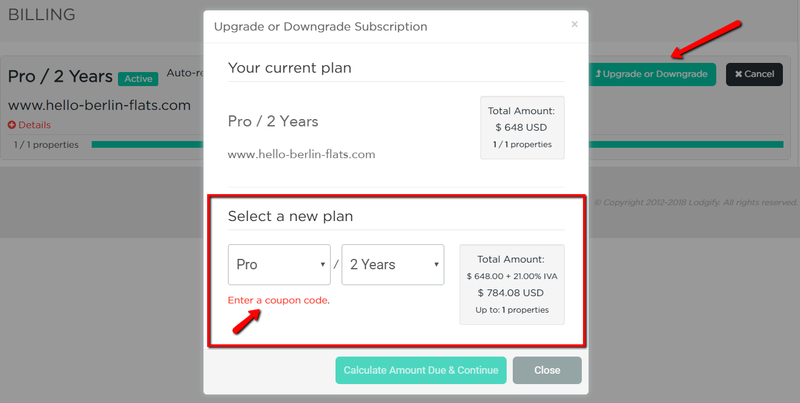 Select a Lodgify Plan (Single or Multi-Property) and choose the subscription plan that applies to the coupon code. Underneath the total price, click Enter a coupon code. Once the discount was successfully applied, enter your credit card information and click Confirm Subscription to confirm your payment. Select a Lodgify Plan and choose the subscription plan that applies to the coupon code. Click here or go to Menu and click Billing. Select the website you want to upgrade the subscription for, click Upgrade or Downgrade, and go to Select a new plan. Choose the subscription plan that applies to the coupon code and click Enter a coupon code. Once the coupon code is added click Calculate Amount Due & Continue.